Sizes of Bead SetsRondelle (round) shape is 9mm from hole to hole and 13mm in diameter. Lentil shape is about 15mm from hole to hole. Crystal (lantern) shape is 12mm from hole to hole and 15mm from tip to tip. Pillow (square) shape is 15mm from hole to hole. Mini Kaleras (barrel) shaped is 15mm (length) x 10mm (width) x 6mm (thick). Sizes of Focal BeadsLentil (round): 1"x1". Design is on the puffed side. Back is flat, which has the basic simple background. Pillow (square): 1"x1". Design is on the puffed side. Back is flat, which has the basic simple background. Kalera (rectangle): 1 1/2" (38mm) long, 3/4" (19mm) wide and 1/4" (6mm) thick. Design on both sides. Oval: 1 3/4" x 2", 1/4" (7mm) thick. Both sides are flat. This is the largest size bead we carry. Design on both sides. Puffed Heart: 3/4" x 3/4" (18.5 x 18.5mm). Design on both sides. Hole SizeThe size of the hole for ALL beads is about 3/32" (2.5mm). If you want to use beads for changeable jewelry or BeadPens, please add that note to your order, so we can ensure each single bead fits the pen. Large Hole Beads with Sterling Silver CoreWe have many designs online now, all with a sterling silver lined. 4.50mm large hole fits Pandora, Trollbeads and all other similar changeable jewelry. 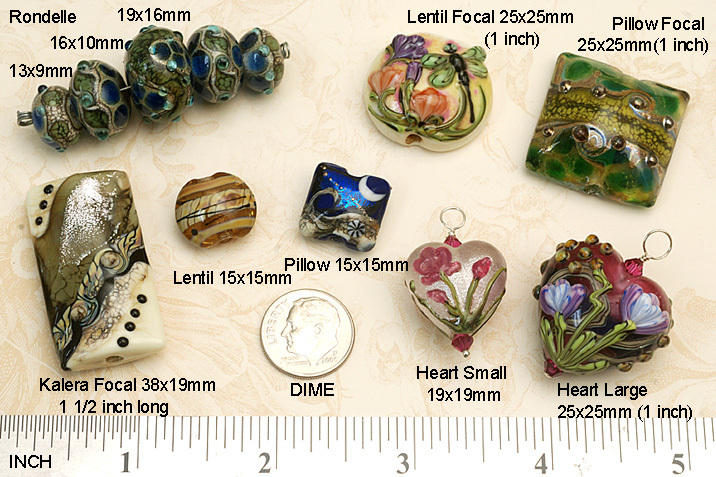 Bead size is about 9mm x 13mm.